In many cases people want transferring files between iPhone and PC easier. Computer hard disk is a good place to store media but not an ideal one to enjoy them on the go. iPhone does well in taking HD photos but isn’t good at storing them as its limited space. MKV gives high video quality on a computer but cannot be read by iPhone, so transfer all of those unsupported formats to computer? That’s not what I meant. You can view them either on PC or on iPhone as long as you have a powerful transferring tool which not only transfers files quickly, but also convert them to iOS-friendly format. 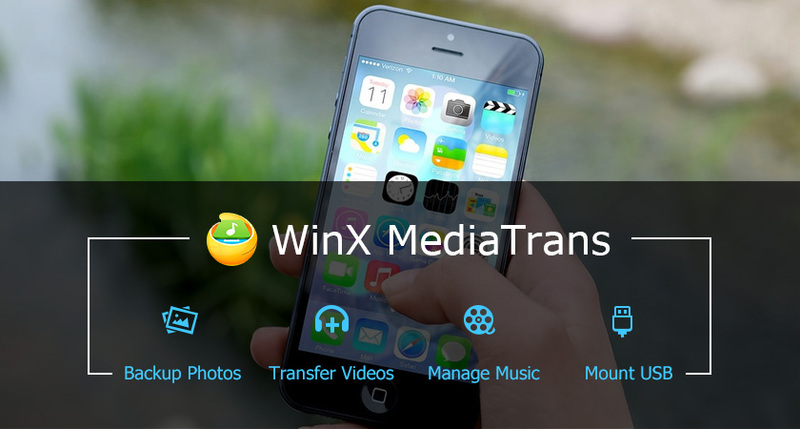 What I’m talking about is WinX MediaTrans, an iPhone PC suite which helps you to transfer, convert files and manage iPhone/ iPad/iPod media on PC easily. What Makes WinX MediaTrans Distinguished as One of the Best iPhone PC Suite/Manager? With user-friendly interface, based on cutting edge technologies like Intel QSV and Nvidia NVENC hardware acceleration, this iPhone manager brings you unmatchable experience by transferring files at the highest possible speed in simple methods. It helps you to maximize iPhone space, backup files, export 4K videos of big size and flexibly manage iPhone music on PC. These features distinguish it among the iPhone PC suite software in the market currently. With this best iPhone PC suite, you can transfer music from iPhone to PC for enjoying anytime anywhere with only several clicks. Also, it exports iPhone music back to PC when you want to free up iPhone storage or update its music playlists. It has unmatchable loading and transferring speed so that backing up tens of high quality music takes only half a minute. Unlike iTunes, it never erases the old data on your iPhone, so you don’t have to worry about that. If you think that managing music can be a pain with the restrictions of the limited size of iPhone screen and complex operations, this iPhone PC suite is definitely the one to choose. With it you can easily rename, delete iPhone music playlists, edit music information like artist, album, etc. and get an overview of the music quality, format and duration with the file structure of your phone showing in an organized way on Windows PC. How to add music to iPhone with WinX MediaTrans? How to Export iPhone music to computer? To import videos from PC to iPhone in a traditional way (like using iTunes) can be long and boring. Once the transferred videos are incompatible with your iPhone, the time will be spent in vain. Fortunately, with WinX MediaTrans, one can easily transfer a feature-length 4K movie to iPhone or PC in minutes and convert any videos (MKV, FLV, AVI, 4K, HD, UHD) to iOS-friendly formats for later playback, editing or other operations on iPhone, iPad, iPod. This best iPhone manager helps you to transfer photos from iPhone to computer quickly and flexibly. It takes only 8 seconds to export 100 4K photos. (The running speed of your PC also influences the transferring speed). The photo transfer divides your pictures into groups by year/month/date, so you can export the photos you took during some time separately as you wish. This iPhone PC suite doesn’t only transfer content between iPhone and PC, but also share media between other IOS devices like iPod, iPad and your computer. Connect your iDevice to computer and see how it transfers music, videos and photos neatly for you. Nice sharing! And I also know another transfer software called FonePaw iOS Transfer which is popular and stable. You can transfer music, photos, videos, messages, the best is that it can transfer WhatsApp data like messages and photos.